All you do is go to the bottom of this page, click on 'comments' icon, and follow the instructions to register your deposits. Your deposits will inspire others too.. In the meanwhile, here are a few inspiring voices from the participants of the Feb,'12 batch of Heart of Effective Leadership program held at Asia Plateau from 15th to 18th Feb, 2012. "Thanks Dilip Sir. I agree with you to keep in touch at regular intermission. Let’s start my self, sharing “Charo Taraf Hai Hariyali” implemented with my spouse & my both beloved daughters, was extremely joyful moments!! "You have rightly said, that we should start sharing our thoughts/experiences with all. I would like to start with me. After coming back from HEL experience , I tried some of the games at my home like "human chain made at Plateau" and reversing it and "Har tarf hai hariyali". It worked amazingly well and amid the tension of the final examination, both my children and my wife became stress free. Apart from saving water and electricity when not required, We are also trying as a family to live without polythene bags and use jute/paper/cloth bags. My family joins me to move ahead with India i Care. Siemens Power Engineering Pvt. Ltd., "
I am really glad that you are applying your learning to real life successfully. We are really proud of you as a fellow Indian.I recall you being in our family group and sharing mature thoughts, helping others balance out their views and attitudes. How is your experience with Quiet Time? Do share. We hope to see you soon to help make India a truly great country! 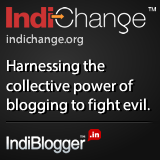 I would like to share the I of C (Initiative of change) that I promised to bring in my daily Iife. This last weekend I did the cleaning and oiling of my son’s bicycle which was lying unused and also did a short practice cycling which I use to do more than decades ago. I will avoid using my 2-wheeler to save on petrol, reduce pollution and also exercise by cycling . I have kept the momentum alive by more aggressively following the practice of recycling waste water from the washing machine, saving electricity and refusing polythene bags. The above is actively supported by my family members. Congrats on account of “India I Care” activity adopted promptly by you & your family. Keep it up the tempo! "Thank you both very much for passing on the news of your "sustaining the change" and taking inspiring actions. Perhaps you will inspire at least five others to take similar steps based on their inner inspiration by the end of March. We will pass on your news to others who come here, in particular to the senior Admin Service trainers who are here for a programme right now. "I would also like to share about I of C.
As decided on the last day of program, myself, Kamlesh & Dr. Kishor started car pool immediately wef 20.2.12 for coming to office. I also started on effective utilization of water & electricity at my home (though it was difficult to enforce on my family members). Where to start from? Let me thank all of you being a part to India I care. This is going to be a great learning experience being in touch with good people in and around. Everyday opening a mail box and receiving a single mail from anyone of you will give the sustainability to take forward the I of C ideal. From my side, let me admit I have been scolded by my wife as soon as I let her know about the programmed and the learning I got. She immediately told me I use to tell u all this what you have gained the knowledge at panchgani. Bolti hai meri baate tumhe idealistic lagti thi aur real life mein use nahi aayegi. Itni dur jakar tumhe apni galti ka ehsas ho raha hai. Kya kya sunaya friends. BUT ABOVE ALL SHE WAS ALWAYS RIGHT. Well as soon I started wearing the YELLOW t shirt of INDIA I CARE AND CHARACTER BANK OF INDIA written behind, few of my friends asked me about this and I got the opportunity to inform and explain about the panchgani learning. Lets see if I can influence few more people from my side. Thanks and take care of yourself. This is most heartening! It is one thing to take steps and feel good when you are at Asia Plateau; but what you are doing is practising it in the field and in the real world. Your actions are very encouraging to all of us at Asia Plateau. Please do keep sending your news. Please remember the regular every morning quiet time. That is the secret of sustaining the change and taking it forward! Can we hope to see you again with your families. Warmest regards and a million thanks! It has really motivated to all of us. Hope we all shall maintain the same spirit. It has really motovated to all of us. I hope we all shall maintain the same spirit. We have started to let our good spirits drive us rather than the bad ones. Thanks! HEL team for reviving a good person inside us. When we think in quiet time, it gives us a sense to differentiate between good and bad, and also remind us the mistakes we did in past,which probably we can correct in future. Hope, we can continue for our better future. Any body who is reading these deposits, should add one of his/her too. My recent deposit is to use not more than one bucket of water for bath. I was moved by some of the stories Prof R Rajagopalan presents in his 'Environmental Crisis, and Our Responsibilities'. - i carry a cloth bag with me where ever i go, in order to avoid usage of plastic bags in case of any purchases. my first Friday starts today... up till 11 months back i was able to live with Rs. 500 as a pocket money. after joining the service that mean first job ever, i dont know how i am spending so much. so i deposit this today that i am going to consume less and consume only essentials.